Posted on Sat, Feb 4, 2012 : 1:56 a.m.
Every February at about this time I wonder how the Burns Park Players will manage to top their previous year’s musical offering. And every year I leave impressed. “Once Upon a Mattress,” the group’s musical adaptation of Hans Christian Andersen’s fairy tale “The Princess and the Pea,” which opened Friday night at Tappan Middle School, is overflowing with larger-than-life charm. I keep having to remind myself that these are non-professional community actors up on stage—neighborhood folks who put on an annual show to raise money to support the arts in Ann Arbor Public Schools. Anyone familiar with the Players knows that well-done, eye-popping productions are the rule, and "Mattress" didn't break with that tradition. Seriously, it was that good, starting with the incredibly detailed, colorful costumes and sets and continuing with a pitch-perfect orchestra, terrific singing, way above-average acting, and dancing (even tap) that didn’t miss a step. As always, the family-themed show, directed this year by Ann Arbor native and University of Michigan musical theater grad Quinn Strassel, managed to include around 100 children, grades 1-5, blending them almost seamlessly into the story. Those little princesses and knights sure looked adorable in their costumes, as the oohs and ahhs around the auditorium confirmed. "Mattress" has some great character roles, and cast members made the most of them. An audience favorite was the humpbacked “Wizard,” played with Igor-channeling relish by Joel Swanson. When he was on stage it was impossible to look at anyone else, and hard to keep the laughter under control. The character of Winnifred the Woebegone (the princess of the title) needs have just the right mix of brassy naivete, and Caroline Huntoon pulled it off perfectly. She’s got personality to spare. Chip Letts did a great job as the mute King Sextimus the Silent, telling volumes with his facial expressions and broad physical gestures. His attempt to explain the facts of life to his son via a charades-like song (“Man to Man Talk”) was as funny as it sounds like it should be. Gretchen Suhre as the overbearing Queen Aggravian made for a hiss-worthy villainess, Eva Rosenwald brought sparkle to her role as the jester, and Lisa Harris was in superb voice as the show’s singing minstrel/narrator. Meanwhile, the overly-mothered Prince Dauntless was sweetly played by Tim McKay. The young lovers Sir Harry and Lady Larkin - Barry Fuller and Colby Spencer - sang beautifully together, with “In A Little While” a real treat. Speaking of the songs, the musical numbers were all excellent, with special notice given to Princess Winnifred’s near show-stopping “Shy,” “Happily Ever After” with its pint-sized seven dwarves, and the energetic “Song of Love.” Susan Pearlman’s costume design and the work of set designers Jeri Rosenberg and Mark Tucker (and their crews) really deserve special mention. Bright, fairy-tale colors abounded. And lest I forget, Talia Glass’ yellow-feathered nightingale in a huge, gilded cage really helped put the tail end of this production over the top. Finally, there’s one more element of "Mattress" that’s praiseworthy, and it has nothing to do with the performance. At intermission, make sure to try the homemade chocolate-chip cookies on sale at the concession tables. Like the show, they are not to be missed. Seriously. They were so good I bought two. "Once Upon a Mattress" continues through Feb. 11. For more information, see the preview article. Sun, Feb 5, 2012 : 5 p.m.
Sun, Feb 5, 2012 : 6:04 a.m.
Why do you keep calling it &quot;Pea&quot;? 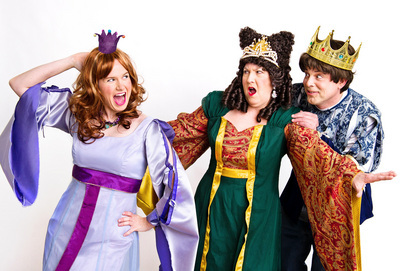 It's &quot;Once Upon a Mattress,&quot; and it's not the Burns Park Players' adaptation. It was on Broadway with Carol Burnett decades ago. And Quinn Strassel is a native of Ypsilanti, not Ann Arbor. Sat, Feb 4, 2012 : 8:37 p.m.
4th article about this play with that same photo in a week. Just sayin. Sat, Feb 4, 2012 : 10:20 p.m. This is the first one that I have seen, so I guess I'm glad there have been 4 articles. i assume the pic is their &quot;promotional&quot; one? This production raises thousands of dollars for the arts in AAPS, so I think the more promotion of it the better. Sat, Feb 4, 2012 : 1:45 p.m.